The holidays are a fun yet busy time. With multiple gatherings with family and friends all month long, it's a must to have a few recipe hacks up your sleeve! 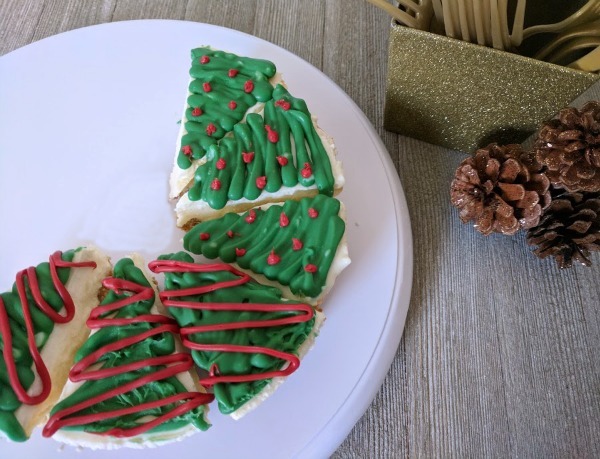 These frozen Christmas Tree Cheesecake slices are perfect to make quick before company comes over and are sure to delight your guests. While I love holiday baking, I also like finding ways to save time and keep things simple in order to spend more time with my family and friends. That's why we're getting together, right? Since I usually make desserts for entertaining at home or to take along, I headed over to the frozen desserts at Meijer. I knew I wanted to make something with Sara Lee® Cheesecake. I absolutely LOVE cheesecake, but I don't love baking it. 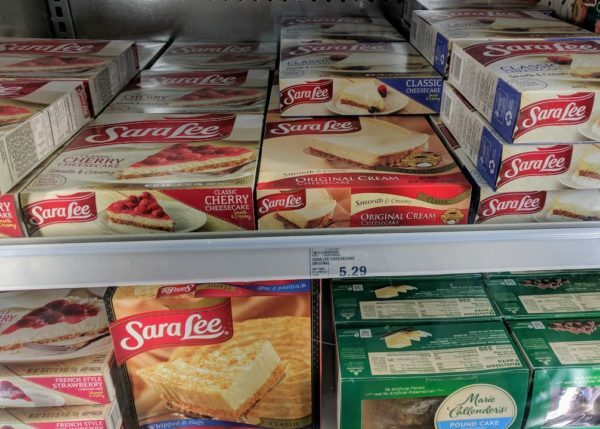 Sara Lee® Cheesecake is made with real cream cheese filling, topped with real sour cream, and finished with a delicious graham cracker crust. Yum! I decided it would be the key ingredient for a recipe hack that can be enjoyed any time of day during the busy holiday season. 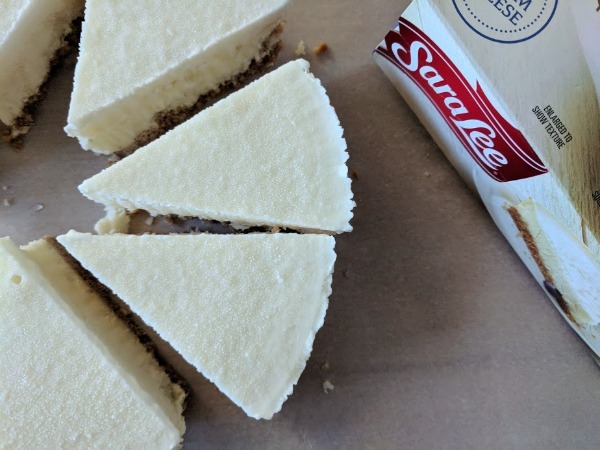 I think frozen cheesecake dipped in chocolate is a delicious dessert and with Sara Lee® Cheesecake I save time by not having to make a cheesecake first! 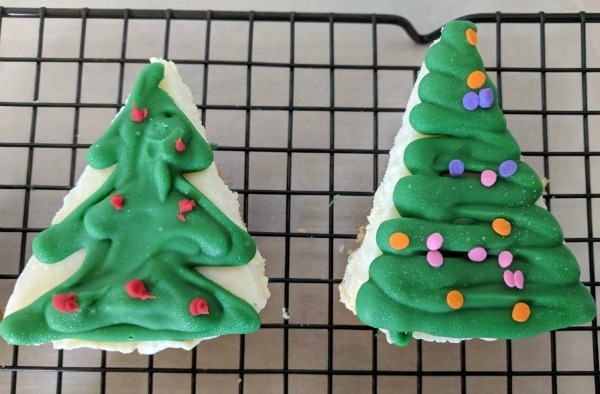 I was able to turn one frozen cheesecake into eight Christmas tree mini desserts in less than an hour. 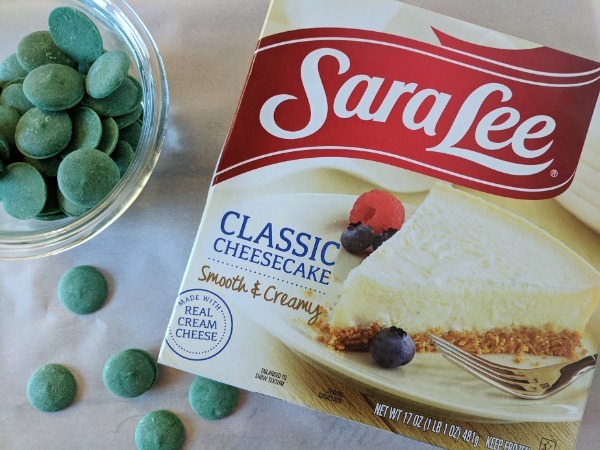 Take your Sara Lee® Classic Cheesecake out of the freezer and remove it from the pan. To cut your frozen cheesecake into eight slices, dip a sharp knife in hot water and wipe dry before slicing. I found a serrated knife worked nicely for this. Pop them back into the freezer until your chocolate is ready to go. Melt your green chocolate. You can melt your chocolate in a candy melting pot, in a glass bowl over a small saucepan of boiling water, or in the microwave in 20 second intervals. Be sure to add vegetable shortening as your chocolate melts. Trust me, it will make piping or dipping MUCH easier. The first time I tried to dip frozen cheesecake my chocolate was not thin enough and was too hot which melted my cheesecake slices too much. Learn from my mistakes! I used about 12-14oz of chocolate wafers and a little over a tablespoon of shortening. Keep stirring until your chocolate is completely melted and smooth. The shortening helps thin it out and makes it possible to let the chocolate cool slightly before piping it onto your cheesecake. You will still want to work quickly! Place a wire cooling rack over parchment paper. Remove your slices from the freezer and place on the rack. This way any excess chocolate that is piped or drizzled over the sides can drip down. Pour your melted chocolate into a disposable piping bag. To make this easier, I place the piping bag in a tall glass and fold the bag down over the glass. Cut a small hole at the tip of the piping bag. Carefully pipe the melted chocolate over the top of your slices. I loved how it looked when I piped it back and forth. I also experimented with completely covering the top of the slice and making Christmas tree designs. Have fun with it! If you are adding sprinkles, you will need to add them fast because the chocolate hardens quickly as it meets the frozen cheesecake slices. Melt a small amount of different chocolate colors to pipe decorations onto your Christmas tree cheesecake desserts. Pop them back in the freezer until it's time to serve your guests. They are cute and delicious! Get creative with different colored chocolates to make Santa hats, reindeer faces, or cut them in squares to make them look like mini holiday gifts. 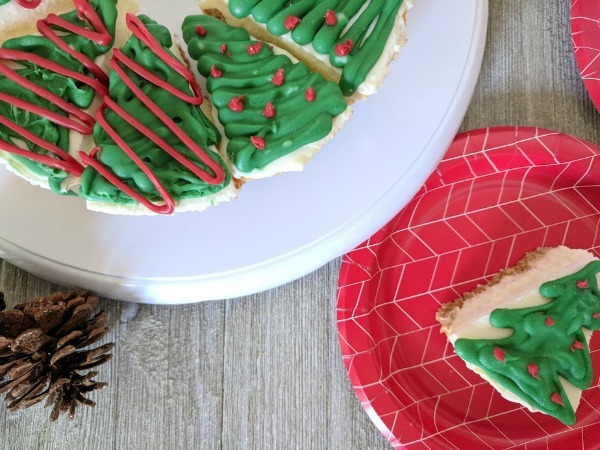 I hope you'll try making these tasty frozen cheesecake Christmas tree desserts. Tyson® products are perfect for all cooking occasions and all holiday season long – from appetizers to desserts. This dessert hack will be a big hit with guests of all ages!